This author has 286 publications. Proceedings of the Eleventh International Conference on Language Resources and Evaluation (LREC 2018), Miyazaki, Japan. Editor: Nicoletta Calzolari (Conference chair) and Khalid Choukri and Christopher Cieri and Thierry Declerck and Sara Goggi and Koiti Hasida and Hitoshi Isahara and Bente Maegaard and Joseph Mariani and Hélène Mazo and Asuncion Moreno and Jan Odijk and Stelios Piperidis and Takenobu Tokunaga. Publisher: European Language Resources Association (ELRA). Language Resources and Evaluation 52. pp. 217-247. Ikerketa hizkuntza-ingeniaritzan. Zer laguntza eman dezake makinak, euskaraz argitaratzen den guztia eskura edukita? Fernández Beatriz & Pello Salaburu (arg.) Ibon Sarasola, Gorazarre. Homenatge, Homenaje. 345-361. Bilbo: UPV/EHUren Argitalpen Zerbitzua. ISBN: 978-84-9082-097-1. Maria-José Ezeizabarrena & Ricardo Gómez (arg.). Eridenen du zerzaz kontenta: sailkideen omenaldia Henrike Knörr irakasleari (1947-2008), 179-206 or., Bilbo: Universidad del País Vasco/Euskal Herriko Unibertsitatearen Argitalpen Zerbitzua. ISBN: 978-84-9082-092-6. Lecture Notes in Computer Science (LNCS) vol. nº 7817 , Alexander Gelbukh (Ed. 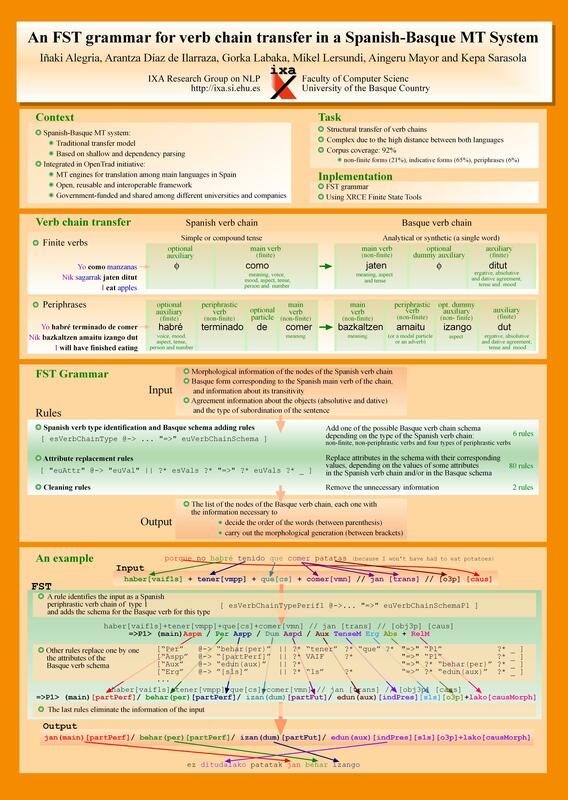 ), Computational Linguistics and Intelligent Text Processing. Springer.13th International Conference, CICLing 2013. Part II. pages 513-524. DOI 10.1007/978-3-642-37256-8_42, Print ISBN: 978-3-642-37255-1, Online ISBN 978-3-642-37255-1, Series ISSN 0302 9743. Publisher: Springer Berlin Heidelberg.Copyright Holder: Springer-Verlag Berlin Heidelberg. Procesamiento del Lenguaje Natural 47, 137-144.
in Actas del XXVII Congreso de la Sociedad Española del Procesamiento del Lenguaje Natural (SEPLN 2011), pp. 381-389, Huelva (España). Workshop on Language Technology applied to biomedical and health documents. SEPLN 2010. 6 de septiembre de 2010. Valencia, Spain. Ways and Modes of Human Communication. Caballero, R & Pinar, M.J.(Eds.) Ediciones de la Universidad de Castilla-La Mancha. Cuenca. (España). ISBN 978-84-8427-759-0, pp: 963 - 972. COLING'90, Vol. 3, 452-454. Helsinki. 1990. Proceedings of Iberamia, 723-726. Mexico. 1990. Procesamiento del Lenguaje Natural, Boletín no. 7, 131 - 137. Enero. 1989.